Hillary Clinton would make a better president than Bernie Sanders: The Democratic front-runner has the right skills for gridlock politics. Clinton’s skill as a bureaucratic infighter makes her the right pick for an era of political gridlock. As president, Bernie Sanders or Hillary Clinton would have to use executive power, stacking the courts, empowering Cabinet officials, shaping regulatory boards. Photo illustration by Natalie Matthews-Ramo. Photo of Bernie Sanders by David McNew/Getty Images. Photo of Hillary Clinton by Joe Raedle/Getty Images. There’s no question: Compared with Sen. Bernie Sanders’, Hillary Clinton’s agenda for the United States is less transformative, more incremental, and more committed to the status quo. Tuesday’s Democratic presidential debate made this clear. Sanders wants free college education, funded by a tax on Wall Street transactions. Clinton, by contrast, wants a means-tested system for debt-free college. Students, under her plan, would still have to contribute to their education, either through work or other campus activities. Sanders wants to break up the largest banks, full stop. Clinton wants to focus federal attention on other major actors in the financial system and only break up big banks if they pose a risk. You could read this contrast as a fundamental dispute over the nature of the American welfare state, and in extension, the future of American liberalism. But I wouldn’t. 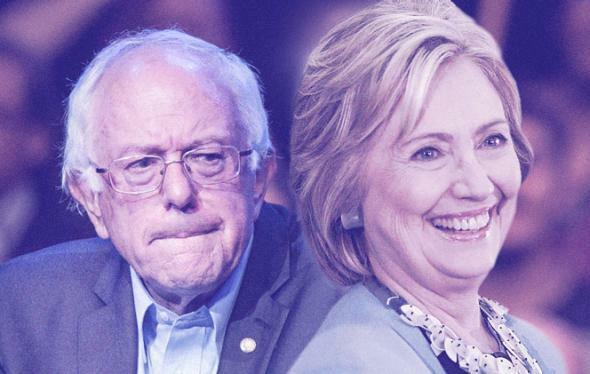 Clinton and Sanders have serious differences, but on core issues of domestic politics—income redistribution, access to health care, immigration, civil rights, and the financial system—they’re on the same side, moving in the same direction. And because Sanders is a “democratic socialist”—basically someone in the mainstream of Western European politics—the practical difference, again, is of speed and scope. All of this is grist for partisans in both camps. Clinton supporters will shout down Sanders as ineffective (“We’re progressives who get things done!”) while Sanders’ allies will attack Clinton as a sellout to the rich and powerful. But if you ignore this conflict and widen your aperture, you’ll see the degree to which both candidates are stuck in the same place, despite their competing labels and approaches. If either wins the White House, both Clinton’s tortoise and Sanders’ hare will run into the same obstacle—barring an unprecedented shift in the rules and conditions of American politics, there’s no possible world in which they could achieve their core aims as president. Look at a map of U.S Senate and House races. Unless Democrats win in a landslide, the House will be controlled by the GOP through 2016 and into the next election cycle, if not beyond. At best, Democrats win the White House and the Senate, which leaves them where they were from 2011 until the end of 2014. Stuck. With a Democratic Senate and a Republican House, Congress won’t move legislation except to fund the government and lift the debt ceiling (and given radical Republican intransigence, that’s not a guarantee). If President Clinton or President Sanders wants to accomplish anything, she or he will have to use and utilize executive power, from filling the bureaucracy and stacking the courts to empowering Cabinet officials and shaping regulatory boards and agencies. This isn’t small-ball politics. To the extent that President Obama is a success, it’s almost despite his neglect of nominations, appointments, and bureaucracy. In his first term, Obama gave scant attention to vacancies on the federal judiciary and the Federal Reserve board. The latter, in particular, was a huge strategic mistake. Obama’s neglect of the Fed—which has enormous influence over economic performance—narrowed his field of action on the economy, enabling mass unemployment and weak demand. Overall, Obama’s poor management has led to a series of self-inflicted crises, from the Department of Veterans Affairs scheduling scandal to the Office of Personnel Management computer hack to the disastrous rollout of healthcare.gov. Twenty years ago, it was possible for a Democratic president to make law with a Republican Congress, or vice versa. Today, it’s virtually impossible. The only way President Sanders or President Clinton will accomplish anything is through skilled use of bureaucratic power. So far, however, both candidates are silent on how they would act as an executive. Instead, both Clinton and Sanders are essentially running as legislative leaders, when the real challenge is how she or he would utilize the substantial power they have to direct and influence bureaucrats and regulators. That’s not to say their rhetoric isn’t important. That Sanders believes in a “political revolution” against money in politics tells you about his priorities as president. And Clinton’s legislative incrementalism gives you a good signpost to how she’ll work with Congress. But, the truth is that—in terms of writing new laws—both agendas are inert. They aren’t passing Congress. Indeed, if Democrats hold the White House, they’ll hold an inverse presidency of sorts. Like a second-term president, Clinton or Sanders will have to focus on executive power. To have legislative traction, she or he would have to wait for broader shifts to the electorate, as well as redistricting in 2020. It’s only then that the big plans are plausible. So, what comes next? And, for Democratic primary voters, who is best equipped to be president in a time of gridlock, where the choice is executive action or nothing? Clinton’s bureaucratic experience, her skill with partisan conflict, and her clear willingness to work against the spirit of the law—as illustrated by her State Department email controversy—make her a prime pick for this era of political grinding. To that point, on guns, Clinton has already vowed to take executive action to close a loophole that lets private brokers sell guns without giving a backgroound check to the buyer. But this brand of politics is hard and cynical, which is perhaps why Clinton can’t build enthusiasm like Sanders, who has a positive vision for political life, even if it’s unavoidably bound to structural realities. As for the GOP? It doesn’t have this problem. Whether it’s President Rubio or President Cruz, the Republican Party will have unified control of government. In which case, the question for voters—and for observers—is more existential than instrumental. Will this be the sober GOP of presidents past, or will it be a Freedom Caucus with power? Yes, Bernie Won Every Poll on the Internet. Hillary Still Won the Debate.